Paddock House Farm Holiday Cottages... We have 6 Luxury Holiday Cottages. Accommodating from 2 - 35 persons in any combination. Ash Holiday Cottage has 3 bedrooms sleeping 6-8 persons . Beech Holiday Cottage has 3 bedrooms sleeping 6-10 persons. Oak Holiday Cottage has 3 bedrooms sleeping 5 persons. Hazel Holiday Cottage has 2 bedrooms sleeping 4-6 persons. Elm Holiday Cottage has 1 bedroom sleeping 2-4 persons. And Cherry Cottage has 1 bedroom, sleeping 2 persons. 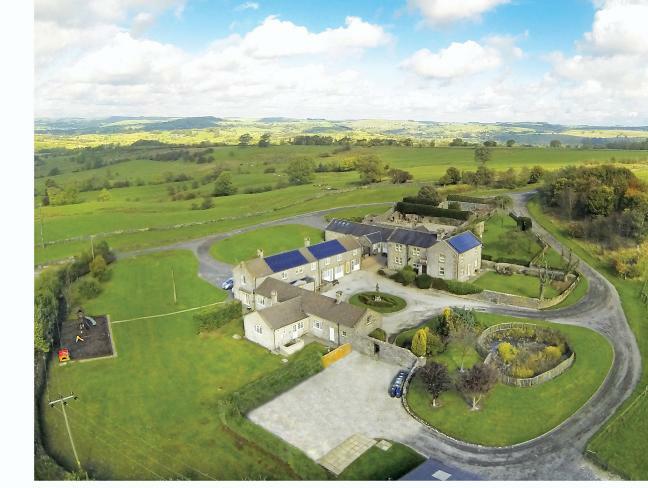 Paddock House Farm Holiday Cottages lies about 2 miles to the north of the most attractive village of Alstonefield which nestles in the heart of the Peak District National Park. Alstonefield is located just inside Staffordshire with the Derbyshire border being immediately to the east of the village following the course of the River Dove. Alstonefield lies amidst the beautiful southern area of the Peak District between the towns of Buxton, Bakewell, Matlock and Ashbourne. The area is famed for its stunning scenery with rolling hills dissected by beautiful valleys with Dovedale and the Manifold valley lying immediately east and west of the village. The area offers great scope for walking riding and other country pursuits. Local villages provide a variety of everyday facilities and Alstonefield has a charming village inn. The nearest shop is at Hulme End where milk, newspapers and provisions are available and the Post Office is at Hartington, 4 miles away, which also has tearooms, shops and a cheese factory (famous for it's Stilton cheese). The nearest railway station is at Buxton - 13 miles and the nearest bus station is at Ashbourne - 9 miles. The regional towns are all within easy driving distance and provide an excellent range of shops and recreational opportunities. The larger centres of Derby, Sheffield, Nottingham, Birmingham and Manchester are all within easy reach. All our Holiday Cottages are surrounded by spectacular countryside with open views. Set in 35 acres of grounds with access to 5 acres of gardens and grassland. For a small walk just wander up the main tree lined drive and admire the open views.